Marie Antoinette Canales is a master calligrapher, illustrator, caricaturist, artist, and instructor. She earned her Bachelor of Fine Arts degree in Studio Art and Advertising at the University of Texas-Pan American (now UTRGV) and her Master of Arts degree in Illustration at Syracuse University in New York. She studied calligraphy in Belgium with calligraphers to The Queen of England. Marie’s calligraphic works are in personal collections worldwide and The White House. Marie has taught at UT-PA, South Texas College; for major corporations, educators, museum groups and privately since 1985 in Texas, Washington D.C., and Italy. She has written two calligraphy books. Marie’s teaching philosophy is that “desire is more important than talent. If you have the desire to learn something, you will”. Canales designs classes that help to develop your artistic ability, inspire creativity and encourage the use of a new marketable skill. Marie Antoinette Canales is a master calligrapher, illustrator, caricaturist, artist and instructor. She earned her Bachelor of Fine Arts degree in Studio Art and Advertising at the University of Texas-Pan American (now UTRGV) and her Master of Arts degree in illustration at Syracuse University in New York. She studied calligraphy in Belgium and calligraphers to the Queen of England. Marie’s calligraphic works are in personal collections worldwide and the White House. 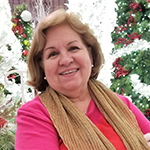 Marie has taught at UTPA, South Texas College; for major corporations, museums, educator groups and privately since 1985 in Texas, Washington DC, and Italy. Canales has written two calligraphy books. Marie’s teaching philosophy is that “Desire is more important than skill, because if you have the desire to learn something, you will.” Canales designs classes that help develop artistic ability, inspire creativity and encourage the use of a new marketable skill.